Same level slips, trips and falls are occupational hazards that can be found in almost every type of work setting. It is estimated that 3.8 million disabling work injuries are caused each year by slips, trips, and falls, accounting for 12 percent to 15 percent of all workers’ compensation costs. Many people are surprised to hear how serious falls can be. The average disabling claims cost of a slip, trip, and fall claim is $22,000. However, the most sobering fact is that slips, trips, and falls cause 15 percent of all accidental deaths, second only to motor vehicle accidents. This guide is designed to help employers identify potential slip, trip, and fall hazards found in the workplace and at home and prevent these type of injuries from occurring. Preventing slips, trips, and falls requires a combination of hazard identification and correction, as well as personal responsibility. The information and tools in this guide can help you in all these areas. 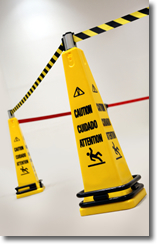 Slips, trips, and falls constitute the majority of general industry accidents. They cause 15% of all accidental deaths, and are second only to motor vehicles as a cause of fatalities. Management should implement fall protection and fall prevention programs to protect employees. Falls from evaluated locations account for the majority of deadly falls. Companies must identify fall hazards and implement effective fall prevention programs and fall protection systems to protect employees. The primary action is to eliminate fall hazards. The US Department of Labor reports that falls are one of the primary causes of occupational death. When an employee is working at a height of four feet or more, the employee is risking a fatal fall: fall protection and fall prevention programs are required. Fall protection must be provided at four feet in general industry, five feet in maritime and six feet in construction. Fall protection is also required when an employee is working over dangerous equipment or machinery. To start a fall protection program, you should first identify the all hazards. Using fall prevention and fall protection engineering controls and fall protection equipment are the primary means of eliminating injury and death from falls. Using work platforms, railings and toe boards provide permanent fall protection when working at heights Fall protection systems are equipment and devices that arrest a free fall or that restrain an employee so that it prevents a fall from occurring. Three factors determine the arresting force from a fall: lanyard material type, free fall distance and the weight of the worker. The use of a shock-absorbing lanyard or a higher tie-off point will reduce the impact force from a fall. Wet or dry contamination on the floor. Loose unsecured rugs or mats. Walking surfaces that do not have the same degree of traction can occur when the floor wears unevenly or at transitions from a floor with high friction,such as carpet, to a floor with lower friction, such as polished marble. Floor contamination can also contribute to slips and falls. Wet sources of contamination include water, oils, grease, and soap from cleaning solutions. Dry contamination includes dusts, powders, granules, and other small objects, such as metal nuts and bolts spilled on the floor. Cords or clutter in walkways. Taking a short cut instead of a proven path. As little as a 1/4-inch rise in a walkway can cause a person to stub his toe, resulting in a trip and fall. The same thing can happen going up a flight of stairs. With only a slight difference in the height of subsequent steps, a person can trip and fall. One strategy for reducing trip hazards caused by raised portions of sidewalks or other walkways is to grind down the raised edge. Another type of fall can occur when you unexpectedly step down to a lower surface. For example, when an individual thinks he is on the last step of a set of stairs, but he has one more step to go before reaching the landing. Stumbling can also occur if a person unexpectedly steps off of a curb or when she steps into a pothole. All work areas, passageways, storerooms, and service rooms shall be kept clean and orderly and in a sanitary condition. The floor of every area shall be maintained in a clean and, so far as possible, a dry condition. Where wet processes are used, drainage shall be maintained and gratings, mats, or raised platforms shall be provided. Every floor, work area and passageway shall be kept free from protruding nails, splinters, holes, or loose boards. Aisles and passageways shall be kept clear and in good repair with no obstruction across or in aisles that could create a hazard. Permanent aisles and passageways shall be appropriately marked. Where mechanical handling equipment is used, aisles shall be sufficiently wide. Improper aisle widths coupled with poor housekeeping and vehicle traffic can cause injury to employees, damage the equipment and material, and can limit egress in emergencies. Load rating limits shall be marked on plates and conspicuously posted. It shall be unlawful to place, or cause, or permit to be placed, on any floor or roof of a building or other structure, a load greater than that for which such floor or roof is approved. Floor openings and holes, wall openings and holes, and the open sides of platforms may create hazards. People may fall through the openings or over the sides to the level below. Objects, such as tools or parts, may fall through the holes and strike people or damage machinery on lower levels. 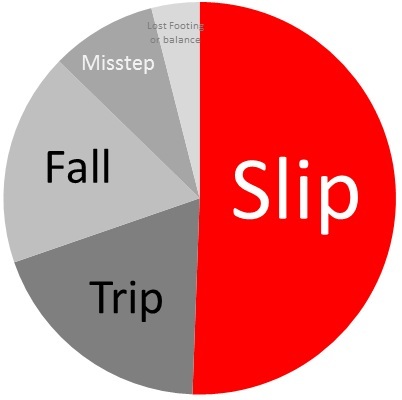 Slips may be more significant than trips and falls. While this may point towards prioritizing slip risks, it is very important to also deal with trip risks, fall risks, missteps and lost footing or balance as they also cause hundreds of injuries. In relation to stairs and steps, both ascending and descending can be hazardous. Descending stairs may be more likely to cause accidents and these accidents may result in more serious injuries. As well as stairs and steps, ramps and kerbs must be considered. Vehicles could include vans, bikes, trucks, trailers. Vehicles operating in sectors other than the transport sector are very significant. Exiting vehicles can be particularly problematic. This section of the website seeks to give practical guidance on the Manual Handling of Loads Regulation, which forms part of the Safety, Health and Welfare at Work (General Application) Regulations 2007. Risk Assessment of Manual Handling Tasks. Traditionally in Ireland there has been an over reliance on the provision of training in correct manual handling as the only means of reducing the risk of injury. Manual Handling is a physical activity that takes place in every workplace, and in some cases the activity does not pose a problem. However it can be a potential workplace hazard when an employee for example is required to handle heavy loads, which could result in a back injury. It will be necessary to carry out a risk assessment of existing manual handling tasks before making an informed decision on which manual handling tasks need to be avoided or reduced. Employers must then take steps to avoid or reduce the risk of injury. tems associated with slips, trips and falls include wet surfaces, ice, food, stone(s)/ rock(s)/ rubble, cables/ wires, uneven/ rough surfaces, oil/ grease, pallets, boxes, potholes, as well as the causes shown. At the start of 2013 HSA Inspectors surveyed workplaces answering the question "Does the written risk assessment consider high risk areas for slips, trips and falls?" Inspectors found that across all industries surveyed high risk areas were considered in 43% of written risk assessments. They were not considered in 29% and not applicable in 28%. 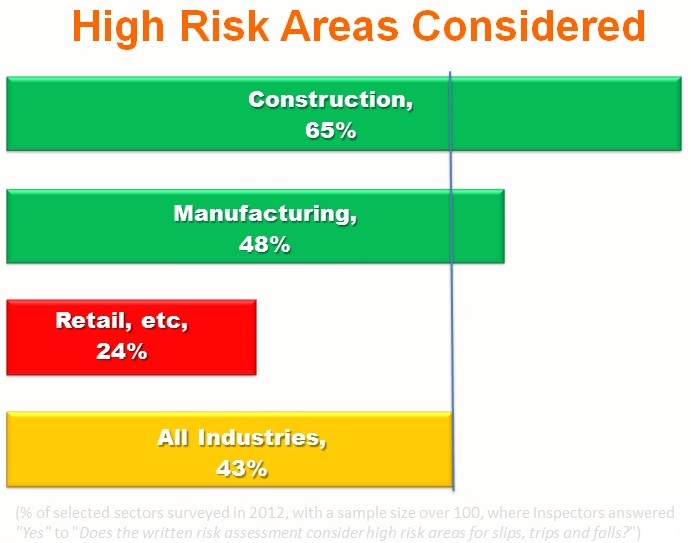 Where applicable, high risk areas were considered in 60% of written risk assessments across all industries surveyed. Inspectors noted that the high risk areas were considered in 65% of Construction and 48% of Manufacturing workplaces. In the wholesale, retail, etc sector high risk areas were considered in 24%, not considered in 37% and not applicable in 39%. Draw a map of your workplace. This could be a sketch map and need not be entirely accurate or exactly to scale. There's no need to have a professional draw this. Consider all potential high-risk areas which may include Transition Areas (including entrances), Level Changes, Sources of Liquid, Cables and Hoses, Damaged Pedestrian Surfaces, Mats, Rugs, and Slippery Surfaces. There may also be circumstances that create workplace-specific high risk areas such as wet-work areas. Mark high-risk areas on the sketch map. Mark locations of slip, trip and fall incidents. It’s a good idea to mark these items so that they stand out. The accident book and accident records should help with this. It may be helpful to include the incident dates, times and cause(s). Near misses should also be shown. Consult employees and other people working in the same workplace, e.g. cleaners, to assist in identifying these areas. Consult employees and other people working in the same workplace. 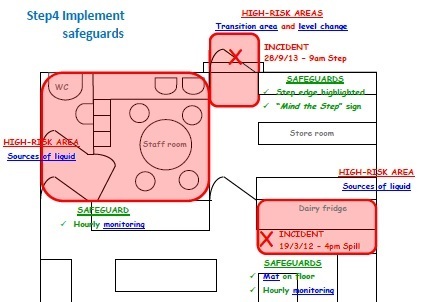 While this tool is based on mapping and locations, it can also be used to consider safeguards based on activities at locations, e.g. routine floor cleaning. Where a high-risk area is identified, the need for increased slip resistance of the relevant pedestrian surface should be considered as well as operational controls. It may be appropriate to provide a surface with improved slip resistance in just the high-risk area. In 82% of cleaning slips, trips and falls, the injured person was not a cleaner. In 78% of cleaning slips, trips and falls, the cleaning activity was floor cleaning. It is important that strict controls are implemented during wet-cleaning of floors. The risks from a wet, damp or drying floor should not be underestimated. 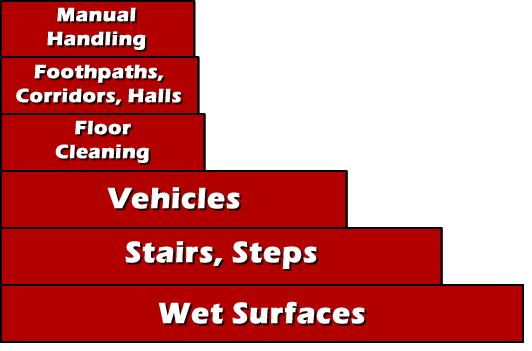 The following issues should be considered as a part of any floor cleaning risk assessment. Floor cleaning may be regarded as a menial task and not well understood There may be an over-reliance on safety signs. Signs should only be used where hazards cannot be avoided or reduced. A review of slip, trip and fall accidents where the floor was being wet cleaned showed that the presence of signs was mentioned in over half of the accident reports. Cleaners may not be aware that wet, damp and drying floors can be very slippery. Basic equipment with a major impact on safety may not be provided, e.g. equipment to allow segregation of a wet floor or proper dilution of chemicals. The requires employers to provide instruction, training and supervision in a form, manner and language reasonably likely to be understood by the employee. The Efficacy of Cleaning Regimes found that the effect of cleaning on slips and the process of cleaning are not well understood by cleaners. Provide cleaners with clear instructions on segregation of wet, damp or drying floors. 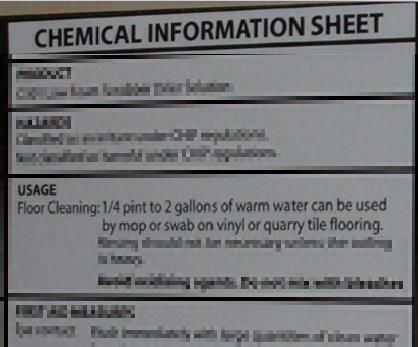 Ensure cleaners have clear instructions on proper dilution of floor cleaning chemicals. In consultation with building operators and users, consider empowering floor cleaners to assess if floors require wet-cleaning or can be cleaned using a dry cleaning method. The report on The Efficacy of Cleaning Regimes found that “smooth floors left damp by a mop may be extremely slippery …. cleaning floors in a more effective manner can significantly improve the slip resistance … Equally, the study shows the pitfalls of using inappropriate cleaning, where visible contamination is removed, removing the visual prompt for a user to proceed with caution, but leaving the floor as slippery as when heavily contaminated…"
Avoid floor wet-cleaning if possible. Consider any advice/ instructions from the flooring manufacturer and the hygiene requirements of the workplace in your risk assessment. Where possible, replace floor wet-cleaning with dry cleaning. Use a vacuum or dry microfibre brush. Where necessary, consult the Safety File for information on safe cleaning methods. Only use polish in accordance with the floor manufacturer’s advice. It’s reported that polish may be added when floor cleaning to improve the appearance of the floor. However this may reduce the slip resistance of the floor. Exercise caution when using floor scrubber-dryers with a squeegee. These machines may not leave a floor fully dry as the squeegee may be worn/ damaged. It’s reported that at the end of construction and before handover to the client, floors can receive a special “handover cleaning” to give the surface a high-gloss appearance. This could severely reduce any slip resistance of the floor. Only products and methods approved by the flooring manufacturer should be used. Where possible, reduce the frequency of floor wet-cleaning. Consider replacing some planned wet-cleaning operations with dry cleaning. Reschedule floor wet-cleaning to a low-traffic time when no/few pedestrians are around. Reschedule floor wet-cleaning to allow maximum drying time before the floor is used again, e.g. clean the floor as the last operation before leaving the workplace so that it can dry overnight. 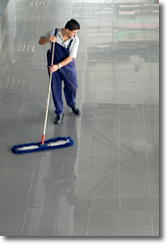 Arrange the floor cleaning schedule in consultation with building operators and users. Provide, maintain and replace, as necessary, proper equipment to enable cleaners to prevent access to wet, damp or drying floors (e.g. cordon systems). Segregation must not prevent emergency access/egress. A cleaner will not be able to segregate a wet, damp or drying floor without a proper cordon, barrier or similar system. A cleaner will not be able to use the correct amount of a chemical. unless there are containers to enable proper dilution or some other dosing system. Provide equipment and chemicals recommended by the flooring manufacturer/ supplier. Avoid chemicals and equipment that could damage a floor or reduce slip resistance. Actions to increase visibility of a fluid include a colour contrast between flooring and likely fluid contaminants, such as cleaning products. Carefully control the use of “wet floor” signs. Signs were present in over half of floor wet-cleaning slip, trip and fall accidents reviewed. Signs should only be used after all other possible safeguards have been tried. Prevent access to wet, damp or drying floors until fully dry. Segregation must not prevent emergency access/egress. Where possible, clean the floors of rooms when they are unoccupied and prevent access until the floor is fully dry. Segregate the wet, damp or drying floor area with a physical barrier or cordon until fully dry. For larger floor areas, it may be necessary to wet-clean the floor in sections, segregating each section until fully dry. Ensure proper safeguards if using a method that limits the amount of liquid on the floor such as spray mopping. A damp floor can be more dangerous than a wet floor as it may be just as slippery as a wet floor but it may look dry thus removing the visual prompt to proceed with caution. Prevent or limit access until the floor is fully dry. Stairs and steps are significant causes of slips, trips and falls. In relation to stairs and steps, both ascending and descending can be hazardous. Descending stairs may be more likely to cause accidents and these accidents may result in more serious injuries. Ramps, kerbs and other level changes must also be considered. Identify areas where levels change, e.g. slopes, ramps, steps/ stairs, unexpected holes, bumps, drainage channels. Slip resistance of level changes should be considered - as well as operational controls. It may be appropriate to provide surfaces with increased. In 2014, found that substantial amounts of stairs in Mining (50%), Manufacturing (48%), Healthcare (40%), Construction (39%) and Retail (32%) did not have clearly visible contrasting nosings. They also found that no activities were restricted on stairs/ steps in many Agriculture (97%), Transportation (93%), Construction (81%), Manufacturing (76%), Mining (69%), Accommodation & Food (60%) and Healthcare (53%) workplaces visited. Keep stairs clean & tidy. Keep stairs dry. Deal with spills effectively. Exercise great caution when cleaning stairs - ideally stairs should be cleaned when they are not in use and cordoned off. Avoid having to carry items on stairs, especially open liquid containers, e.g. by use of dumb waiters. Avoid having to rush up or down stairs. Do not use hand-held devices while using stairs. the ceiling, either hanging over a work bench or by means of an electrical pole. The pole is basically a conduit for electrical wiring to be brought down from the ceiling and provides outlets into the middle of a room or work area. If adding additional outlets is not possible and the cords must be stretched across the walkways, always tape or otherwise secure the cords to the floor. Securing the cord or hose will prevent employees from getting their feet under the cord and tripping. Several tools on the market can help to cover cords. Cord strips can protect the cords from damage and prevent tripping as long as the strip itself is lying flat or secured to the floor. For carpeted surfaces, a Velcro strip can be used to secure the cord tightly to the carpet. Unlike tape, these Velcro strips can be reused. An effective method for preventing trips on a temporary cord is to lay a rug or piece of carpet over it. As long as the carpet lies flat, the likelihood of tripping on the cord is greatly reduced. A floor hole cover of standard strength and construction.While the cover is not in place, the floor hole shall be constantly attended by someone or shall be protected by a removable standard railing. There is equipment with which falling materials could create a hazard.Every runway shall be guarded by a standard railing, or the equivalent, on all sides 4 feet or more above floor or ground level. Wherever tools, machine parts, or materials are likely to be used on the runway, a toe board shall also be provided on each exposed side. Every flight of stairs with four or more risers shall have standard stair railings or standard handrails as specified below. Stair width is measured clear of all obstructions except handrails. a) Guardrails shall be provided on all open sides of unenclosed elevated work areas such as roof openings, platforms, ramps, or any other working location that are more than 30 inches above the floor, ground, or other working areas of a building. Exception: Platforms, ramps, runways, or other working level constructed prior to January 1, 1967, that are less than 4 feet above floor, ground, or other working level, are not required to have guardrails. b) A standard guardrail shall consist of a top rail, a midrail or an equivalent protection and posts. c) The distance between the floor and the upper surface of the top rail shall be within the range of 42 inches to 45 inches. d) The top rail shall be smooth-surfaced through the length of the railing. e) The midrail shall be approximately halfway between the top rail and the floor, ground or other surface it is attached to. NOTE: Local building regulations may require 9- inch spacing of midrails. f) The mounting of guardrails shall be such that the top rail is capable of withstanding a downward load of 20 pounds per linear foot applied either horizontally or vertically. A "standard stair railing" (stair rail) shall be of construction similar to a standard railing, but the vertical height shall be not more than 34 inches nor less than 30 inches from the upper surface of the top rail to the surface of the tread in line with the face of the riser at the forward edge of the tread. Stairways less than 44 inches in width may have one handrail unless the other side of the stairway is open. In that case, the open side shall have a handrail. Stairways with less than four risers are not required to have a handrail. Stairways giving access to portable work stands less than 30 inches high are not required to have a handrail. b) The upper surface of handrails shall be placed no less than 34 inches or more than 38 inches above the nosing of treads and landings. c) Handrails shall be continuous the full length of the stairs. d) Handrails shall be designed to prevent falls by providing a grasping surface to theuser. e) In handrails projecting from a wall, the space between the wall and the handrail shall be at least 1 ½ inches. f) The mounting of handrails shall be such that the completed structure is capable of withstanding a load of at least 200 pounds applied in any direction at any point on the rail. a) Stairways that serve an occupant load of more than 50 shall have a width no less than 44 inches. b) The run shall not be less than 10 inches as measured horizontally between the vertical planes of the furthermost projection of adjacent treads. The largest tread run within any flight of stairs shall not exceed the smallest by more than 3/8 inch. The greatest riser height within any flight of stairs shall not exceed the smallest by more than 3/8 inch. c) Treads of stairways shall be slip-resistant. d) Headroom clearance of stairway shall be no less than 6 feet 6 inches. Such clearance is determined by measuring the vertical distance between a plane parallel and tangent to the stairway tread nosing, to the soffit above at all points. a) Surface of ramps shall be roughened or shall be of non-slip materials. b) Ramps that serves any exit way, provides handicap access or is in the path of travel shall not have a slope that exceeds 1-foot rise to 12 feet of horizontal run. Exception: Existing ramps shall not exceed 1-foot rise to 8 feet of horizontal run. c) Ramps with slopes exceeding 1-foot rise to 15 feet of horizontal run shall have handrails or stair rails as required for stairways. d) Ramps more than 30 inches above the adjacent ground or floor are to be provided with guardrails. Working areas, stairways, aisles, passageways, work benches and machines shall be provided with either natural or artificial illumination which is adequate and suitable to provide a reasonably safe place of employment. Fixed industrial stairs shall be strong enough to carry five times the normal anticipated live load. At the very minimum, any fixed stairway shall be able to carry safely a moving concentrated load of 1000 pounds. All fixed stairways shall have a minimum width of 22 inches. Fixed stairs shall be installed at angles to the horizontal of between 30 deg and 50 deg. Vertical clearance above any stair tread to an overhead obstruction shall be at least 7 feet measured from the leading edge of the tread. The chief hazard when using a ladder is falling. A poorly designed, maintained, or improperly used ladder may collapse under the load placed upon it and cause the employee to fall. A ladder is an appliance consisting of two side rails joined at regular intervals by crosspieces on which a person may step. This guide has focused on preventing same level slips, trips, and falls. While falls from ladders do not fit into this category, this section includes basic information about ladder safety because a majority of businesses have employees who use ladders. as opposed to an aluminum ladder when employees are working in proximity to electrical wiring. A worker needs to have access to a ladder that is tall enough to do the job safely, otherwise, he may be tempted to take an unsafe short cut and stand on the top step of the ladder. Proper cleaning procedures, including amount of chemical cleaners to use. Use of the handrail on stairs. Safety considerations when using ladders. Appropriate slip-resistant footwear for the job and when to replace worn footwear. Slip response expectations and general housekeeping expectations. In addition to these topics, businesses are encouraged to provide staff with additional training. General awareness training can help employees appreciate the frequency of slip and fall injuries and the impact it can have on individuals and businesses. Using material handling aids such as a cart can reduce an employee’s risk of a slip, trip, and fall injury. Train staff to turn sideways when stepping over obstacles that are higher than mid-calf or in slippery conditions. This reduces the risk of a fall from a slip or a trip. This technique can be used more often than people think such as when stepping over logs, conduit, pipes, or when stepping out of a bathtub. When stepping over an obstacle while facing forward, the heel of the shoe touches the ground first before the individual rolls on to rest of the shoe. With just the heel striking the ground, there is only a small area of traction, increasing the chance the front foot will slip. In addition to the limited traction on the front foot, the individual is typically raising the heel on their back foot further reducing their traction. When facing forward it is difficult for the individual to see their back foot. Since it is difficult to see, the individual may not raise their back foot high enough causing it to strike the object as she steps forward. If the back foot touches the obstacle, it may trigger the hop reflex. When the back foot strikes an object as a person faces forward, most people will tend to take a small hop forward which increases the chance the individual will lose her balance and fall. By turning sideways and stepping over an obstacle, the entire foot can more easily be placed on the ground. This increases the traction over facing forward and reduces the risk of a slip. In addition, it is easier to see the obstacle reducing the risk of the individual striking it accidentally. In many cases, turning sideways can make it easier for the individual to use his or her hands to hold on to an object for balance when stepping over the obstacle. In the event the foot accidentally strikes the object when facing sideways, the ‘hop reflex’ is reduced making it easier for the individual to keep his or her balance. In addition to training staff on how to carry a box to maintain maximum vision of the ground, it is beneficial to train staff on what is an appropriate walking speed. A contributing cause of many slip and trip injuries is an employee who is in a hurry and moving too quickly. One of your rules should be that no running is allowed. Ensure spills are reported and cleaned up immediately. Use no-skid waxes and surfaces coated with grit to create non-slip surfaces in slippery areas such as toilet and shower areas. Use only properly maintained ladders to reach items. Do not use stools, chairs, or boxes as substitutes for ladders. Aisles and passageways should be sufficiently wide for easy movement and should be kept clear at all times. Temporary electrical cords that cross aisles should be taped or anchored to the floor. Eliminate cluttered or obstructed work areas. Use prudent housekeeping procedures such as cleaning only one side of a passageway at a time, and provide good lighting for all halls and stairwells, to help reduce accidents. Provide adequate lighting especially during night hours. You can use flashlights or low-level lighting when entering patient rooms. Instruct workers to use the handrail on stairs, to avoid undue speed, and to maintain an unobstructed view of the stairs ahead of them even if that means requesting help to manage a bulky load. Promote safe work in cramped working spaces. Avoid awkward positions, and use equipment that makes lifts less awkward.